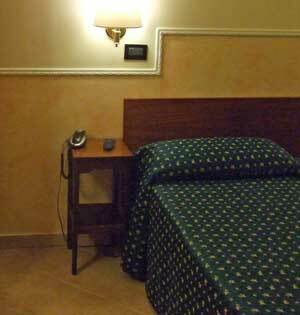 Hotel Ascot is a true budget option in Rome. When I was searching for a hotel in March 2009, it was one of the cheapest which turned up through hotel searches, and what's more, the two-star hotel had a good rating from past guests. The location on the less convenient side of Stazione Termini isn't one I'd choose normally, but this seemed like a good bargain and worth checking out. I booked a single room on a Saturday night for €50. It was a room-only deal, though I could have added breakfast for another €5. This was excellent value, though I arrived with doubts about the location. In Rome the station is just far enough from the historic centre that you end up relying on buses, and it isn't the most appealing area to stay in. However my spirits rose as I saw a big illuminated sign which led me to the hotel. The hotel occupies part of a shared building, and the front door was kept locked for security. After ringing the bell a second time, and giving my name, I was buzzed into the (perfectly decent) public stairwell only to find that the lift was out of order. I began to drag my suitcase up the two flights of stairs to the hotel reception, regretting my choice of accommodation. But then I heard the sound of footsteps and encountered the charming receptionist, who had run down the stairs to take my case from me and apologise for the lift situation. From then on, all my impressions were positive. The receptionist was welcoming and friendly, and she spoke excellent English. The little lobby and adjacent breakfast room were simple but nicely presented - it wasn't grand but it was very nice indeed for a hotel of this category. Similarly, when she showed me to my room, it was of the size and simplicity one would expect from a cheap hotel, but with more comfort, cleanliness and 'niceness' than most. I had booked a single room but was given a double, which had two twin beds pushed together, just one of which was made up with sheets and pillow. The bedroom would have been small for two people, but as a base, it would still have been perfectly acceptable for a couple compromising on luxury in order to save money. 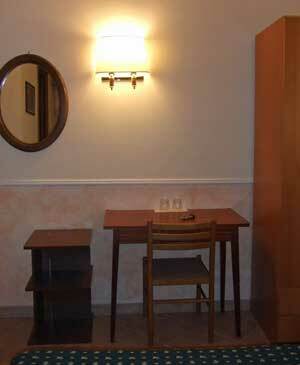 From the hotel floor-plan, it appeared that other double rooms may have been larger. My previous few nights had been spent in more expensive hotels, and I'd expected the Ascot to suffer in comparison. But actually it compared very favourably with other hotels. One of the first things I did on arrival was to hang my coat up behind the door - and this simple act exemplified the hotel's standards. It is quite rare to find coat-hooks in hotel rooms in Italy, and I am often irritated by the lack. This little extra seemed to me to be symbolic of the Hotel Ascot. Although the hotel kept to its two-star rating and didn't offer luxuries, the owners had obviously considered their guests' comfort and put effort into ensuring that what they offered was as good as it could be. There was just enough room to walk around the bed, and against one wall was a small but practical work desk, a wardrobe and a shelving unit. The frosted glass window opened over an internal space, so there was no street noise. The television fixed high in a corner had a poor reception, though I did find CNN. The walls were nicely-painted and ornamented with Van Gogh prints, while the floor was tiled. The decor of the bedroom and bathroom was good quality, new, fresh and clean. The bathroom was impressive for a budget hotel, with good fixtures. 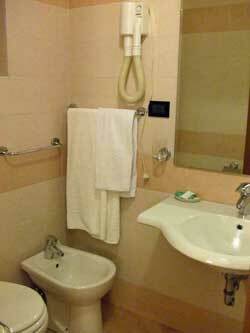 The bathroom was of an acceptable size though the bidet was cramped in a corner. The shower was large and sufficiently powerful; I did find the temperature shifted, however. Towels were white and soft. Toiletries were very minimal: soap and a little sachet of shower gel. The only negative thing about the bathroom was that the toilet flush seemed to activate a mysterious whining noise lasting several minutes. I didn't eat breakfast in the hotel, so I can't give a full report but I glanced into the nice little breakfast room, and the offering appeared to be a typical budget continental breakfast consisting of croissants, rolls and hot drinks. I wandered down the road to a cafe-bar (called Giuliani) which had rather expensive prices at the waiter-served tables, but where I paid just €2.50 for a pot of tea and a rich filled croissant to consume standing at the bar. The hotel didn't have much in the way of public space; just the little reception area with a couple of chairs, the breakfast room and a foyer with a couple of armchairs. These were all clean and pleasant, though. I encountered several receptionists, and they were all friendly and obliging. On departure, the hotel staff kept my luggage for me - I did note that my suitcase was left in a public area, although on request they put my valuables in a private room. Ideally, I would still prefer to stay somewhere either picturesque or very close to the historic centre. 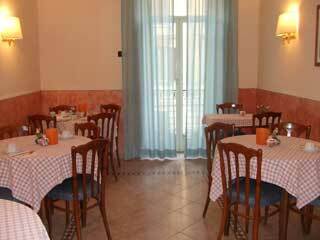 But Termini is a very handy location for travellers and saves the hassle of lugging your suitcases across town. I was very impressed with the hotel itself, and I thought that for the price, and the two-star rating, you would be unlikely to find better. 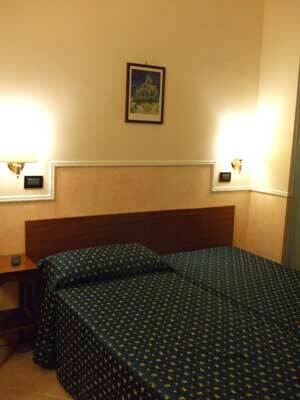 For budget travellers who don't mind using public transport to get around Rome, this would make an admirable place to stay. I would certainly return, and would recommend it to others. Hotel address: Via Montebello 22. Leaving Stazione Termini head right onto Via Marsala, which runs alongside the station. Follow this road to the left, and continue over the wide pedestrian crossings, as it changes into Via Volturno. You can also get to Via Volturno by heading straight out of Termini, past the bus ranks and then following the main road a short distance to the right, before heading over the crossing. A short way down Via Volturno you should see the illuminated sign for Hotel Ascot on the right-hand side of the road. By the sign, turn into Via Montebello and Hotel Ascot is almost immediately around the corner. The area around Termini isn't terribly savoury. However, the wide streets on the way to the Hotel Ascot felt quite respectable; the only unpleasant moment was passing some shamefully drunk but harmless British men. The hotel is about 8 minutes (depending on the traffic lights) from the bus ranks and the railway and Metro station. From here you can get anywhere in town using public transport; I reached the Spanish Steps about 25 minutes after leaving the hotel. Hotel Ascot review by Italy Heaven editor.